Meet the superhero volunteers who came together to put on an action-packed fundraiser for Children’s of Alabama—and some heroic kids who inspired them. A hero is someone who overcomes outrageous odds or risks personal safety for the benefit of someone else. A SUPER Hero is all that and more, typically with the help of some special power and a far cooler outfit. You would be surprised how many dwell among us. The short story is that a nonprofit had a fundraiser for a good cause, but the magic was watching what happens when individuals work together for a collective good. What do you get when you cross a hospital, a nonprofit, a creative agency, local businesses, and college football fans? You get enough goodness to light up the city. There are over 50 Rotary Clubs in Alabama’s District 6860. Ten years ago, they combined a bunch of stuff the South does best and hosted a “pre-football-season-shrimp boil-tailgate.” Attendees and sponsors showed out in their team colors, and that first year Boiling N’ Bragging raised $1,200. They donated the money to Children’s of Alabama Critical Care Transport, and just like that—Rotary 6860 found its cause. This year will mark the event’s 10th year, and Boiling N’ Bragging has now generated roughly a million dollars. Now when the Children’s of Alabama helicopter lifts into the air, it does so with the support of Rotary. To be a Super Hero you need to fly across the sky and save the day—and that’s exactly what Jason Peterson does. As the director of Children’s Critical Care Transport, he has flown over 800 flights. Help is immediate; within 15 minutes of the call, the team is in the air. Many flights transport patients from other medical facilities, but the team has navigated less accommodating circumstances, like the time they landed the chopper in the parking lot of a BBQ restaurant. Sometimes you do what you gotta do. I work for a Creative Agency called Kernel, created by Spectrum Reach. Like all creative directors, I routinely get to take credit for the remarkable talents of my team. I cannot, however, take credit for their hearts. When asked by Spectrum Reach account executive and proud Rotary member Randy Jinks to support Boiling and Bragging, they hatched their own plan. 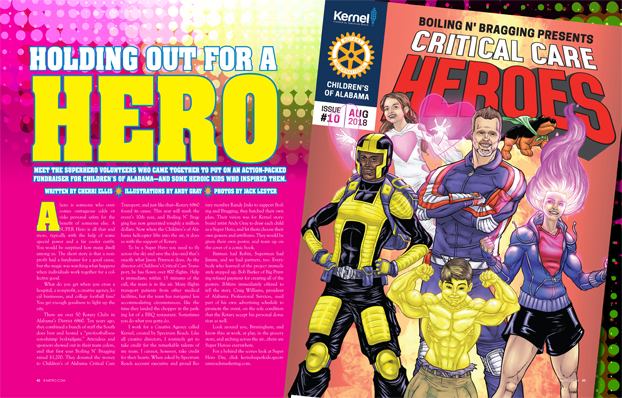 Their vision was for Kernel storyboard artist Andy Gray to draw each child as a Super Hero, and let them choose their own powers and attributes. They would be given their own poster, and team up on the cover of a comic book. Batman had Robin, Superman had Jimmy, and we had partners, too. Everybody who learned of the project immediately stepped up. Bob Barker of Big Printing refused payment for creating all of the posters. B-Metro immediately offered to tell the story. Craig Williams, president of Alabama Professional Services, used part of his own advertising schedule to promote the event, on the sole condition that the Rotary accept his personal donation as well. Look around you, Birmingham, and know this: at work, at play, in the grocery store, and arching across the air…there are Super Heroes everywhere. For a behind the scenes look at Super Hero Day, click kernelsuperkids.spectrumreachmarketing.com. Ragan has a smile that makes her appear lit from within. Two years ago when she was 14 years old, she was celebrating Memorial Day at the lake with her family when the jet ski she was riding was crashed into by another jet ski. She was airlifted off the dock by the Critical Care Transport Helicopter and taken to the closest hospital in Huntsville. The same day, the helicopter brought her to Children’s of Alabama. Her mother told me that 90 percent of the people who suffer her level of brain trauma never make it to the hospital, and of the 10 percent who do, 90 percent of those patients never regain consciousness. Ragan walked into our studio with no assistance other than the hand of her mom for balance. Like only a 16-year-old girl can, she rocks skinny jeans and loves shopping. Her Super Hero would have flaming hair and super strength, but—most importantly—be wearing ankle booties and just the right hoodie. At six years old, Raimi displays a very self-assured demeanor. At our photo shoot, when she was asked to pose in a certain way as if she was flying, she very pleasantly said “No.” She wasn’t upset and felt no need to elaborate, but Raimi felt zero compulsion to comply. It was delightful. She brought along her 10-year-old cousin Gianna, who quickly got the lay of the land and essentially began functioning as her agent. They had with them a stuffed dog who had been outfitted in a cape emblazoned with the letter S, which they explained was because his name was Captain Sprinkles. At six months old Raimi was in a Walmart with her mother and grandmother and began choking. Her mom performed the Heimlich maneuver, and they rushed her to Children’s Hospital where they discovered no blockage or permanent damage. The thought of what could have happened that day is a cautionary reminder of how life can change on a dime. Raimi’s priorities were that her long dress be white with pink hearts and long sleeves, and she wanted to shoot out hearts as she assisted Captain Sprinkles. Garrett is a handsome young teenager with manners superior to most adults I’ve met. He is the fourth oldest of eight siblings, and he is home schooled. He likes basketball and football, and soccer is growing on him. (There was no mention of baseball. If Garrett doesn’t like something, he is too polite to say so.) As a toddler he was diagnosed with asthma, and twice had attacks so bad that he was air lifted to Children’s. The Critical Care helicopter holds a pilot, nurse, and respiratory therapist, so there is no room for anyone else. I asked his father Tommie if it was terrifying to watch the chopper fly off with his child but not him onboard, and he smiled and said, “No. It was a relief. The terrifying part was before they got there.” Garrett’s requests were to be super strong, fly, and wear a backpack full of tech that he would use to help people everywhere. Posted on Sunday, September 2nd, 2018.